The Far East Film Festival, the worldwide most popular film festival for Asian cinema returns to Udine from April 24th to May 2nd 2015 for the 17th edition. So if you want to experience the Far East Film Festival make sure to book now your room at Hotel Suite Inn at the Best Available Rate! Special discounted price for minimum 3 days stay! The official program has not been published yet, don’t miss the latest news on the official Far East Film Festival website! 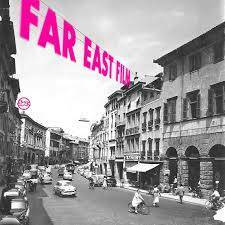 Are you travelling to Udine during the Far East Film Festival? Are you looking for your accommodation in Udine during the Festival? From Hotel Suite Inn it takes you… …15 minutes walk to get to the Theatre Giovanni da Udine, the main venue for the Far East exhibitions, …10 minutes on foot to reach the Cinema Visionario, second venue and the Cinema Centrale, the third venue, …10 minutes and you are in the very heart of the historical city to enjoy the pleasurable and peaceful quality of life of Udine with its variety of inviting typical restaurants and trattorie! ….even faster if you go by bike at your disposal for free. After all don’t miss the traditional FEFF MARKET! Far East Fans, have a look at Suite Inn Special Rate! Stay at least 3 nights at Hotel Suite Inn during the FEFF, we have a special discounted offer! Far East Film Fesival – Book now your room now at Hotel Suite Inn!